This past fall volunteer Deb Thingstad Boe responded for the first time to a Red Cross call for nurses to support Hurricane Florence relief efforts. Deb deployed to North Carolina where she worked in a shelter. Below is an excerpt of Deb’s experience originally published in the December 2018 Minnesota Metro Medical Reserve Corps newsletter. Thank you to Deb for responding to the call to serve when you’re needed most! I found out the deployment process moves fast! I spoke with the Red Cross on September 25, which was almost three weeks after Hurricane Florence made landfall, and six days later I was on the ground in Fayetteville, North Carolina. I was deployed through what is called Direct Deployment (DD), which is a rapid process used to ready healthcare workers for disaster work. Once I received a call from Red Cross staff affirming my desire to deploy, I completed forms and about 15 hours of required online training and attended a deployment training in-person. At this training I received my disaster response ID, and mission and procurement cards. The mission card was used for my expenses and the procurement card was used to help clients (there is training on this!). Along the way I also received a suggested packing list that was invaluable. Among those items were a stethoscope and blood pressure cuff. I found out later that it’s more difficult if you do not own these items when you arrive on assignment without them. The best thing I purchased to prepare was a self-inflating air mattress that fit on the cot I slept on. Ear plugs are a must! If I didn’t wear them, then I worried about whether the next breath is coming for some people. I wasn’t the only healthcare volunteer that talked about that. Although it felt like everything was moving fast, I knew this was what I wanted to do. I decided I would go with the flow, take things as they come and try to do my best. My assignment was to work 12-hour shifts at Smith Recreation Center. This Red Cross shelter was planned to be the last to close in Fayetteville. This meant that as other shelters closed people who had not been able to find housing were relocated to Smith. The shelter had about 150 people in residence, many who were among the most vulnerable people in the city: people with mobility issues, unstable chronic conditions exacerbated by displacement, chronic untreated mental illness, addiction, in hospice care, and (previous to the disaster) long-term homelessness. Every day was different and yet alike. Within the first fifteen minutes of the first day, I was instructed on how to administer Narcan and safety precautions related to the environment. I was informed that public health obtained Narcan for the shelters because there was a death due to opioids. The shelter had many residents who accessed Disaster Health Services on a daily basis. I learned about “shelter cough.” When I arrived many residents and staff had upper respiratory symptoms, and I wondered about influenza and whether residents had been offered flu vaccinations. Just listening was an important component of care. My experience with Public Health came in very handy. Part of the plan to help one woman in the shelter included food as a prescription for her chronic health needs. Listening and choices were critical to helping her. During my three hours with her, I managed to work in stress management tips and the power of positive-thinking and being forward-moving in thought and actions. I finished my time working in rural North Carolina working with the community to identify unmet needs, assess how migrant farm workers were managing, and identify where the Red Cross could help. We partnered with Spanish-speaking restaurant owners to inform the area churches of our presence. They opened up an area of their restaurant for Red Cross services and allowed a food truck to be positioned in their parking lot. People came for blood pressure and glucose level checks, OTC meds, blankets, diapers, and TLC (tender-loving care). Staff assigned included an interpreter, disaster mental health, and disaster healthcare. Listening and caring were critical elements of care. One of the things I enjoyed the most was meeting volunteers from other places. The first night a few of us who had met at the shelter gathered together and headed out to dinner. None of us were assigned to the same place, which meant we met more people the next day. I met a retired pulmonologist and two EMTs, and we had dinner together every night starting on night two of a ten-day deployment. We had fun, and it was a good transition to sleep and the next day. Deb Thingstad Boe is an American Red Cross Volunteer and a Dakota County Minnesota Medical Reserve Corps Volunteer (MRC). Photos provided by Deb. Click here to learn more about becoming a Red Cross volunteer. Thinking of becoming a Red Cross volunteer? These three opportunities support disaster relief. This year, are you thinking of becoming a Red Cross volunteer? Right now in Minnesota, we’re recruiting for three opportunities supporting disaster relief. Each position ensures disaster workers can deliver humanitarian aid at home and around the corner. The American Red Cross serving Twin Cities Area seeks a volunteer to support instructor-led training by scheduling in-person classes and performing other administrative tasks, as needed. This is a flexible-schedule position that can be performed remotely during daytime hours. If interested, please contact Angela Antony (angela.antony@redcross.org). The American Red Cross serving Twin Cities Area seeks volunteers to assist Workforce Engagement with bringing on-board new disaster volunteers. This role guides new volunteers through the first steps of joining the Red Cross, from turning in the right paperwork and signing up for training, to helping them feel prepared for their roles. On-boarding volunteers enjoy working with people, being flexible, and serving on a team. If interested, please contact Hannah Linsk (hannah.linsk@redcross.org). The Minnesota Region needs volunteers to help deploy volunteers to both regional and national disasters. Deployment team members will assign volunteers to Disaster Relief Operations (DROs), give the proper information regarding deployment procedures, distribute mission cards, and perform other duties as necessary. The best candidates will be comfortable working with online platforms and on the telephone. Help us volunteers get out the door! If interested, please contact Susan Waananen (susan.waananen@redcross.org). In November, Red Cross volunteer Mimi Bielinski met with Milton Vallejos after a multi-unit apartment fire in Burnsville, Minnesota. 2016 was a busy year for Red Cross disaster services in Minnesota. Our relief workers did a great job making sure people near and far received Red Cross support during times of need and helping them rebuild their lives after disaster. In addition to helping at home, more than 150 Red Cross disaster relief workers from Minnesota responded (some not once, but multiple times) to national Red Cross relief efforts across the country, including flooding in Missouri, Texas, and Louisiana; water crisis in Flint, Michigan; wildfires in California; and hurricane relief across multiple states along the eastern seaboard. Their service provided shelter, food, and medical and emotional support to thousands of people experiencing some of their darkest moments. Thank you to everyone for the great work done this past year, providing assistance to neighbors near and far. Story and photo by Lynette Nyman, American Red Cross. 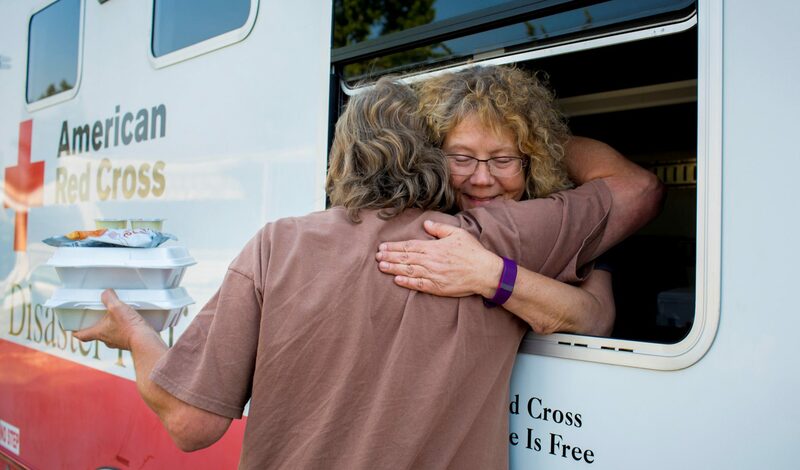 Click here to learn more about the Red Cross in Minnesota. From Florida to the Carolinas, American Red Cross workers from Minnesota have supported Hurricane Matthew relief efforts. Assignments have ranged from working in a shelter and serving meals to coordinating with response partners and providing medical and mental health services. Others gathered stories and helped raise money for the response. Big picture number as of October 27: more than 50 Red Cross workers from Minnesota have deployed to areas impacted by the storm across the southeastern United States. Take a look. Carole Madland visited people in shelters and neighborhoods in North Carolina. Sometimes she hitched a ride to reach isolated communities. Overall, the Red Cross mobilized 2,200 workers, 13 kitchens with partners, and 111 response vehicles for the state. Big picture number as of October 25: the Red Cross has mobilized more than 5,800 disaster workers since Hurricane Matthew first threatened communities in the southeast. Rachel Olmanson took meals to people in affected communities. Above is the view from Rachel’s truck while her team was next in line for food pick-up at a field kitchen in North Carolina. Big picture number as of October 25: the Red Cross and its partners have served more than 1.3 million meals and snacks in affected communities in Florida, Georgia, North Carolina and South Carolina. In Florida, Dave Schoeneck (upper left) assisted with relief effort coordination. The Red Cross has worked closely with government officials and non-government organizations (NGOs), such as Southern Baptist Disaster Relief, AmeriCorps National Civilian Community Corps and others. Big picture number: around 13,000 homes are affected in Florida, Georgia, North Carolina and South Carolina. In South Carolina, Dave Snetsinger (second on right) was a shelter worker. Overall, the Red Cross has had nearly 1,200 workers, 5 kitchens with partners, and 53 response vehicles for relief efforts in the state. Big picture number as of October 25: the Red Cross has helped provide nearly 100,000 overnight shelter stays in Florida, Georgia, North Carolina and South Carolina. Mark and Gail Noren (right and center) are doing search and care, which means finding neighborhoods and people in need of meals and feeding them in North Carolina. Big picture number as of October 25: Red Cross and its partners have served 697,000 meals and snacks across hurricane affected areas in the state. In Georgia, Judy Hanne Gonzalez helped gather and share stories about the Red Cross and its Hurricane Matthew relief efforts. Judy also assisted with fundraising in Florida. Big picture number: as of October 25, the Red Cross has raised $8.1 million in designated donations and pledges for a relief response that’s estimated to cost $24-$28 million. Thank you to everyone who has responded to the Hurricane Matthew relief efforts! We are pleased to announce that Ruth Talford, a disaster relief worker with the American Red Cross Minnesota Region, received the 2016 National Voluntary Organizations Active in Disaster (NVOAD) Spirit Award. This award is given each year to a person who has exhibited outstanding commitment to the NVOAD movement. The award was presented to Ms. Talford during the NVOAD conference held in Minneapolis in late May. Conference participants included more than 400 people representing voluntary organizations from that respond to disasters around the country in a variety of ways, such as feeding, cleaning, and spiritual care. The Minnesota Region of the American Red Cross, the national American Red Cross, and other Red Cross regions were well-represented with several dozen disaster relief workers on-hand. This year’s conference service project was a Red Cross blood drive. Click here to learn more about NVOAD and click here to learn more about the MNVOAD. A cross-border conference called “Disasters Do Not go Through Customs” followed the shelter training. Sponsored by the Rainy River Cross Border Planning Group, the conference brought together around one hundred people from both sides of the U.S.-Canadian border who could work together during major disasters affecting both sides of the international border. Presentations included managing potential threats, such as train derailments, floods, tornadoes, biological outbreak, communication failures, quarantine, wild fires and terrorism. All levels of government were represented from both Canada and the United States. Railroad representatives addressed one of the biggest concerns throughout the emergency management world: train derailments involving large amounts of oil carried by rail. Less than twenty fours after the end of the conference there was a train derailment in Callaway, Minnesota. The accident forced the town of more than 200 people to be evacuated. Red Cross volunteers from North Dakota and Minnesota as well as Salvation Army relief workers were on-scene, providing the care and sheltering that we have trained for and do so well. Story by Tony Guerra, Disaster Program Manager for the American Red Cross Serving Northern Minnesota. You can be a Red Cross disaster relief volunteer. When I saw that the American Red Cross serving Northern Minnesota was looking for a disaster services intern I was immediately interested. Even though I did not have any prior experience with the Red Cross personally, I knew it must be a great place to work. Why else would 330,000 volunteers nationwide serve for free? At this point I am mostly learning about disaster response and capacity building for The Pillowcase Project (a youth disaster preparedness program that the Red Cross is doing in partnership with Disney), which is great because I love doing hands on work and working directly with people. That changed on Friday, January 22, when I was able to go on my first D.A.T. (Disaster Action Team) response with the Red Cross. I was a little nervous due to the fact I had never done anything like this before, but I was lucky enough to be accompanied by our local disaster program manager and seasoned D.A.T. captain Tony Guerra. Before meeting with the affected resident, we drove to the address to see first-hand the condition of the burned house. Due to sketchy cell service and an unreliable maps app we couldn’t find the house, but it turned out there wasn’t much of a house left to find. Later, when we met our client, I quickly learned how hard it is to be really prepared for a house fire, and that no one knows exactly what to do after and much of their belongings are damaged or gone. This client was no different: all she had now were the clothes on her back and, luckily, her purse. In northern Minnesota local community members help the Red Cross provide basic comfort and care to people who have suffered a tremendous loss because of home fire and other disasters. Photo credit: Nancy Rogers/American Red Cross. After we assessed our client’s needs and determined what steps she needed to take next we brought her a donated quilt, which she appreciated so much. Typically these quilts are made by local church groups, and then they are donated to disaster victims and military veterans through the Red Cross. Giving someone in need a quilt is, I think, fitting. Back in the day, imported fabric was expensive for the average person in America and it was difficult to find sufficient, affordable fabric locally. The solution was to salvage scraps of fabric and to sew together into a quilt. Today, after someone has a house fire family, friends, strangers, and the Red Cross come together like small pieces of fabric to help people rebuild their lives. Before beginning this internship, I had no idea how many house fires there were in our area and the damage they do besides burning up the contents of your house: think smoke damage or water damage. Since my first response in January, I’ve had the opportunity to respond to two more fire disasters in northern Minnesota. I was struck by the devastation residents feel after losing much to all of their belongings, and how much Red Cross disaster relief is necessary and appreciated. I hope there will be fewer house fires in the area. But if there are more I hope I have the opportunity respond again, because I have enjoyed lending a hand and making a direct positive difference in someone’s life.